Wayne, Pa. (March 27, 2018) —Tekni-Plex, Inc. has been granted a patent for its Sniff Seal® technology which is the first liner to enable scent permeation through an induction seal closure liner without affecting the seal or compromising the contents. Brand owners are constantly looking for ways to create product differentiation. Consumers are also interested in enhancing their purchasing experience. 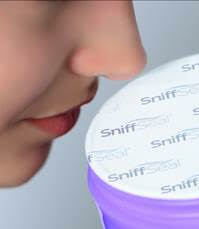 Sniff Seal technology is an ideal way for the consumer to experience a scent in the retail aisle without compromising the seal or the product contents. A wide variety of product categories, including food, beverage, personal care, cosmetics can benefit from the technology. “There are many instances where consumers want to know what a product actually smells like before putting it in the shopping cart. Unfortunately, there are times when consumers peel back seals or remove fitments to experience the scent before buying. When a package is returned to the shelf in a compromised condition, it is no longer sellable. As a result, the retail industry experiences a significant amount of loss annually,” explains David Andrulonis, senior vice president and general manager, Tri-Seal, a Tekni-Plex business unit. Sniff Seal liner technology eliminates the problem because it provides the olfactory experience without removing the seal. This means that the tamper and/or pilfer evidence remains in place and the product integrity is maintained. “An extensive range of products can benefit from this technology. Imagine being able to experience the smell of fresh peanut butter or mango-scented shampoo or spring-fresh deodorant in a retail aisle without removing a seal or a fitment? That’s what Sniff Seal brings to the purchasing experience,” Andrulonis said.